9" x 12" x 1-1/4"
Designed to assist children, the elderly, and people with limited muscle control and individuals with the use of only one hand. The deep inner lip keeps food from sliding off the plate. 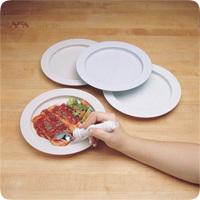 The user brings the fork or spoon to the edge of the plate and pushes the food onto the utensil. 9" (23 cm) diameter. All are dishwasher, autoclave and microwave safe, except for the Non-Skid version.